Update when a payment is due quickly and easily right from the job details to ensure you and your customer are on the same page. Go to the job details page and click 'upon receipt' just below the invoice number. A window will appear where you can change due 'upon receipt' to whatever date you need. You can also change to field to say Net 30, Net 45, etc. 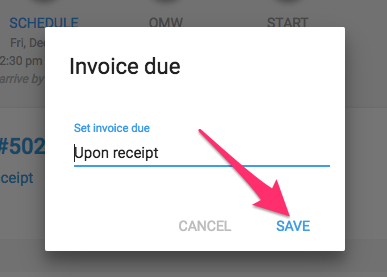 After the information has been updated, click the 'save' button in the bottom right to save the change on the invoice.